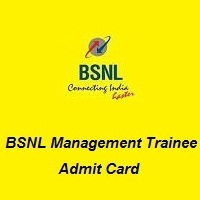 BSNL Management Trainee Admit Card 2019 Is Released…!!! Aspirants who have applied for BSNL Management Trainee Recruitment can download the BSNL Management Trainee Hall Ticket 2019 form this article. BSNL Management Trainee Admit Card 2019 will be issued by the Bharat Sanchar Nigam Limited will be released soon in the month of 6th March 2019. Since it has not released until now, the candidates will not be able to download the BSNL Management Trainee Call Letter 2019. The examination is scheduled for 17th March 2019. We also furnished you with the direct link to download the BSNL Management Trainee Hall Ticket 2019 @ bsnl.co.in. In this website, we also provided you the Information on it, the Selection Process, documents required for the verification purpose, and the required steps to download BSNL Management Trainee Hall Ticket 2019 online. These details are necessary to the Contenders BSNL Management Trainee Hall Ticket 2019 while writing the BSNL Management Trainee examination. The exact details about the candidate are only referred from the BSNL Management Trainee Call Letter 2019. So check whether the details mentioned in the BSNL Management Trainee Admit Card 2019 are regarding you and correct or not. The candidates holding with their respective भारत संचार निगम लिमिटेड Management Trainee Hall Ticket 2019 are only allowed for the written examination. Contenders based on the merit list from the written test are allowed for the Group Discussion, Interview. Document Verification is done for the purpose of verification and confirmation. These are the necessary documents are required at the time of appearing to the exam hall along with the BSNL Management Trainee Call Letter 2019. Move on to the Bharat Sanchar Nigam Limited (BSNL) official website @ bsnl.co.in. When the home page is redirected search the for the link. Or else, you can go to the end of the page. Check the updates which are scrolling to the right of the screen. Click on the relevant link for BSNL Management Trainee Hall Ticket 2019 @ bsnl.co.in. Enter the required details such as User ID, Password and verification code. Check the information once more before submitting. Furthermore, the Complete information regarding BSNL Management Trainee Hall Ticket 2019 will be updated on our website Freshers Now.